After a long hiatus I’m starting to get more interested in the markets these days. To be honest, this has been one of the worse markets to trade that I’ve experienced since I started trading back in the late 90’s and I’ve mostly been in cash this year, never having much more then 10% of my capital in the markets at any one time. There just haven’t been any decent trading setups according to my trading strategy. I’ve been pretty skeptical of how much upside is left and even when my timing signal flipped bullish back in May I really didn’t see my scan results confirming the move. What I want to point out in this post is the change in character from the RSI perspective. 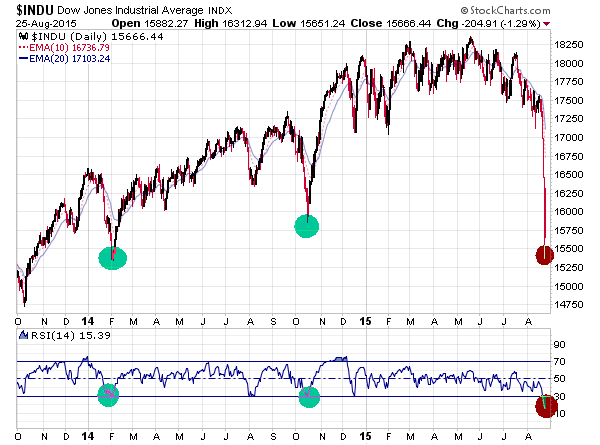 The last 2 dips over the past 2 years say the RSI never really dip to far into the oversold range. Meaning that the bears never really got their groove on. That has changed now and you should really pay attention because this new trend change usually sticks around for awhile. 60 should be the market ceiling on the RSI going forward. So what I’ll be looking for in the markets over the coming 3-6 weeks is 2 things. A small rally where it will give one a chance to establish some short etf positions. The reason I say that #2 is a possibility is the sort of volatility you are seeing now is where crashes happen. It’s where 200 point swings on the Nasdaq start to feel normal. That is the market just warming up for the big one.